John Lord was a 'gifted mechanic' working for Fielden Brothers. In 1835 he left to establish his own engineering business - John Lord and Sons - with his seven sons and financial help from the Fieldens. By 1854 some of the brothers - Thomas Lord, John Lord and Simeon Lord - had other occupations. 1863 Makers of textile machinery and machine tools. 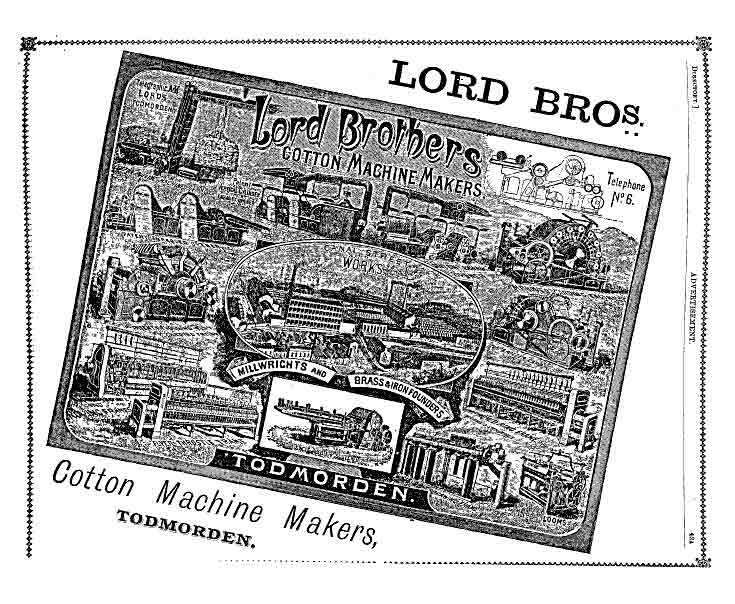 1864 Abraham Lord left the Partnership with Thomas Lord, Edward Lord, and William Lord, carrying on business at Todmorden, as Machine Makers, and Cotton Spinners and Manufacturers, under the style or firm of Lord, Brothers. All debts would be handled by Thomas Lord, Edward Lord, and William Lord, who would carry on the said business on their own account. of Rocks Mill, Smallbridge, Rochdale. of Wood Top Mill, Burnley. This page was last edited on 10 April 2018, at 08:03.